The couple are the founders of Joey’s P.A.W. (Prosthetics and Wheels). The nonprofit organization outfits disabled canines with custom prosthetic limbs and new dog wheelchairs. Tanya fell in love with Joey when she saw his picture on Facebook. He was a double amputee whose hind legs had been intentionally cut off when he was 6-weeks-old. Second Chance Rescue in New York saved his life and got him his first prosthetic limbs. He had been up for adoption for nearly a year when Tanya saw his photo. She and Charlie had recently lost their paralyzed dog, Ella Grace, so the idea of adopting another disabled dog didn’t worry her. They filled out the adoption papers and then waited another 3 months until Joey was big enough to switch out his puppy prosthetics for big dog limbs. Unfortunately, during that time Joey got an infection in one of the legs which required further amputation. It caused him to be unable to wear a prosthetic limb on that leg. Merrick Pet Care covered the cost for these unexpected expenses. They paid for Joey’s medical care, prosthetic leg and the dog wheelchair he now needed. On October 23, 2016, Tanya and Charlie drove to New York City to meet Joey. All the way home, the couple brainstormed ideas about how to turn Joey’s tragedy into something good. They decided to start Joey’s P.A.W. But first, they had to get their boy settled into his new family. Boone is a double amputee dog. Tanya calls Boone her little “Rockstar.” He’s a calm, confident dog who loves attention. Boone was also the victim of an intentional double amputation when he was a puppy. When Tanya heard his story, there was no question that he would join the family. Since then, Boone has become the public face for Joey’s P.A.W. Joey’s heartbreaking history caused him to be afraid of people. He didn’t enjoy being around crowds when Tanya went to talk about the organization. But Boone was happy to meet new people. Tanya said he loves to pour on his hound mix charm and show everyone how fast he can run in his wheelchair. The organization awards prosthetics and wheelchairs to dogs with amputation or paralysis. Pet families in need can complete a brief application on the Joey’s P.A.W. website. Just click on the Contact Us page and complete the information. Tanya asks pet owners to include as much detail about their dog and the family’s financial situation as possible. She responds to applicants within 24 hours. Joey’s P.A.W. 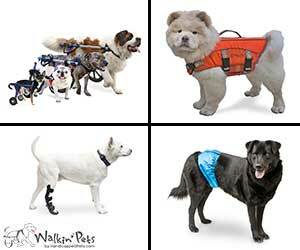 works with 3 of the leading dog wheelchair companies and top-rated Ortho Care for artificial limbs. The equipment is paid by donations from the individuals. Tanya also asks the families to contribute what they can toward the cost of the devices their pet will receive. Joey’s P.A.W. is a young organization, but they have done an outstanding job helping handicapped dogs in need. They put 65 paralyzed dogs in new wheelchairs and had custom limbs made for 6 dogs with amputations. The organization runs on the kindness of public donations that can be made on Joey’s P.A.W. Website. People can make a one-time donation or become monthly donors. I’ve said it before and I’ll say it again, being the caretaker of a disabled dog or cat forever changes your life. I have met so many wonderful people who felt the need to change the world in some way, after living with a paralyzed pet. Some like Tanya and Charlie started charitable organizations, some started rescue groups, and others adopted and fostered paraplegic pets. And others like me, write and share their stories. If your paralyzed dog made a difference in your life, I would love to hear your story.